Phantom of the Universe is a new planetarium show that showcases an exciting exploration of dark matter, from the Big Bang to its anticipated discovery at the Large Hadron Collider. The show reveals the first hints of its existence through the eyes of Fritz Zwicky, the scientist who coined the term “dark matter.” It describes the astral choreography witnessed by Vera Rubin in the Andromeda galaxy and then plummets deep underground to see the most sensitive dark matter detector on Earth, housed in a former gold mine. 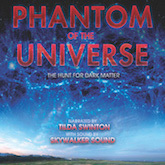 From there, it journeys across space and time to the Large Hadron Collider at CERN, speeding alongside particles before they collide in visually stunning explosions of light and sound, while learning how scientists around the world are collaborating to track down the constituents of dark matter.